Hometown: Hm, that's a hard one. I was the equivalent of an Army brat, born in Waukeegan, Illinois, and lived all over including Piedmont, California, Manila, Philippines, Hong Kong, Honolulu and Madrid. I've lived the longest (11 years) in Portland, Oregon with two stints in Sweden of 2.5 and 4.5 years. 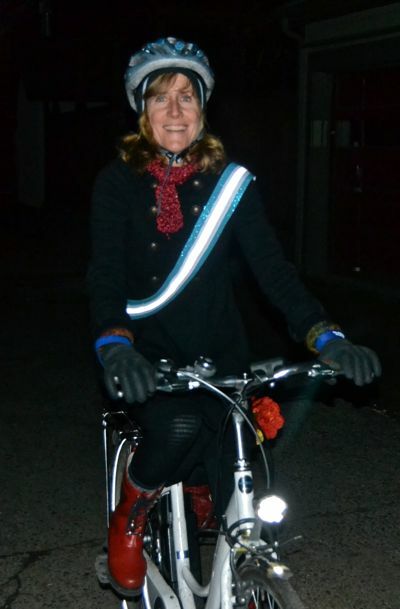 Favorite city to ride a bike in in the world: I have two: Copenhagen, Denmark, especially on a sunny day, and the entire island of Öland, in the Baltic Sea, where I live on my bike. 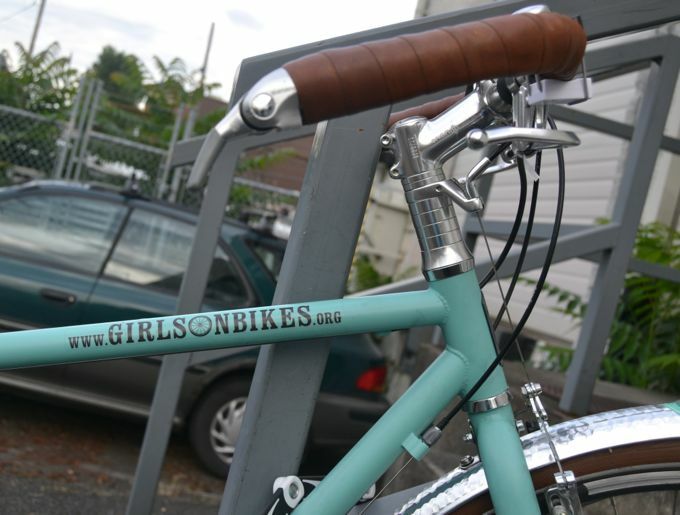 That said, Portland is a fantastic bike city to call home. Describe your personal style: Short skirts, warm leggings, wild socks. I also spend a lot of effort being warm and dry, as I've been car-free for the last six years, so sometimes warmth trumps style. 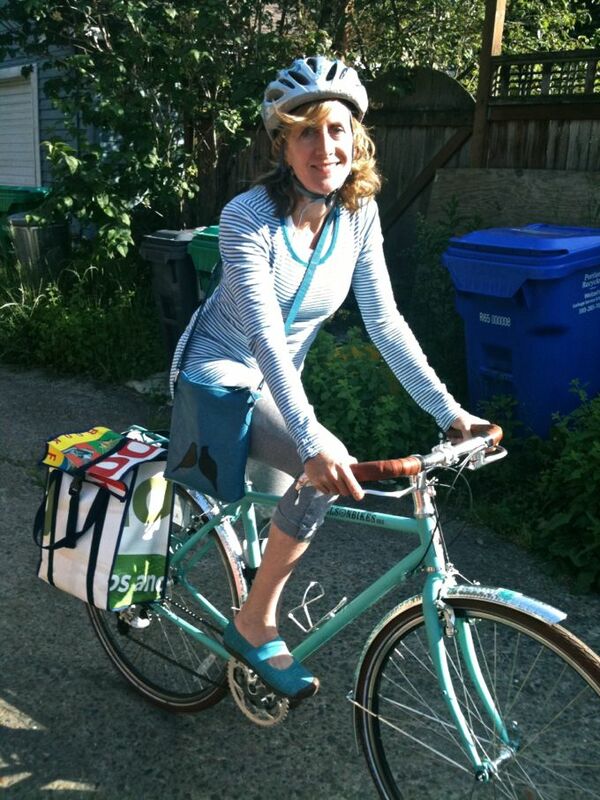 Helmet or no helmet: I'm sort of middle-of-the-road on the helmet issue. My research on the issue indicates to me a slight advantage to helmet wearers in terms of avoiding injury, but I think it is by no means conclusive. I love the feeling of not wearing a helmet, but when in the U.S. I generally wear one. Type of bike(s): Two. Sanyo eneloop pedal-assist, and a Fuji 2012 touring frame, lovingly powdercoated teal blue by my partner. Describe what you like best about your bike(s): The two bikes I have now cover almost all of my moods. If I'm lazy, afraid of arriving disheveled, or have intense hills ahead of me, I take the pedal assist. For very short or longer recreational rides, I love the way the Fuji feels. Describe your urban cycling experience: Since I ride everywhere, I spend some thought on always having the means to be warm enough and dry enough. My personal motto is put on rain pants at the first drops. 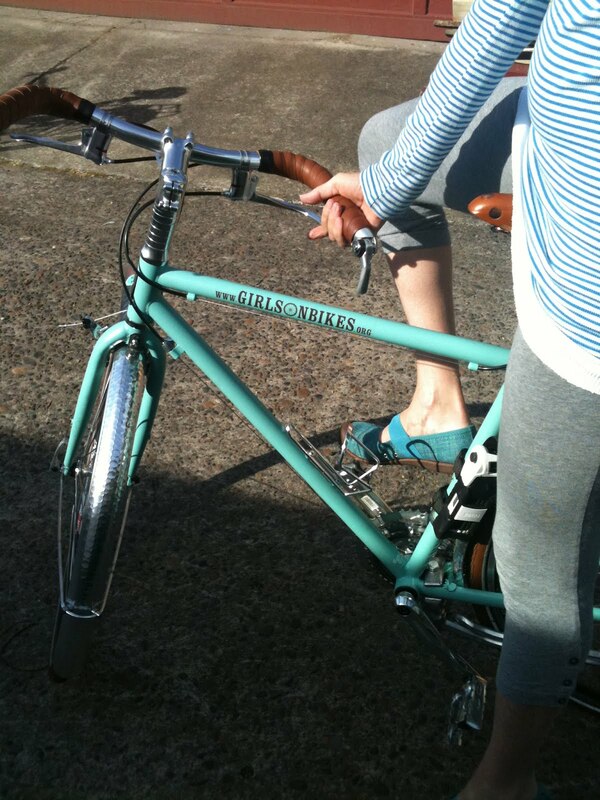 Favorite time and/or place to ride: Mild sunny cycle cruising after fish tacos and pomegranate margaritas or other food from Portland's fabulous food cars, coasting along with friends by my side. Is there anything better? Tell me more about your new book - Women on Wheels - your inspiration, how you completed it, where to find it: Two things inspired me - one, the fact that men still outnumber women on the bike lanes by a 3 to 1 margin. And two, that I truly believe biking is the solution to a number of our shared urban woes - our obesity, out-of-control traffic and stress levels, and even our inner-city air pollution. Well, I guess actually three things - when I was researching bike history and discovered the many unknown heroines of cycling - like Louise Armaindo, the woman cyclist I chronicle in the book who won myriad races riding a high-wheel penny farthing bike (!!!) - I became a bit obsessed. Cycle lore is very male-centric, but women were always playing a role in bike history. 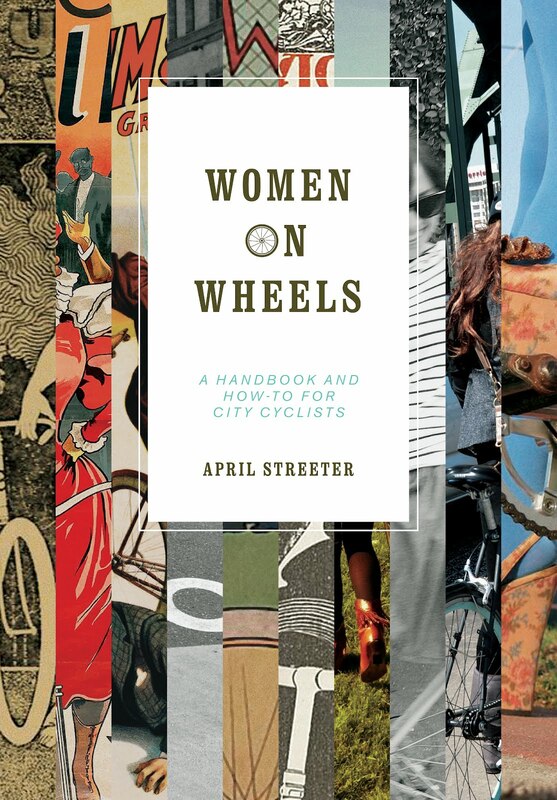 Women on Wheels is widely available in Portland at book and bike shops, also on the web at girlsonbikes.org, and coming soon (late September) to a book tour near you! Where will your bike take you in 2012: So many places - a myriad of Portland Pedalpalooza fun rides throughout June, a great Oregon wine country loop last week of 42 miles that turned into 52 miles when we got lost in the Amity hills, and daily duties on the streets of Portland. Vélo Vogue tip of the day: The two best words in biking are 'thank you'! 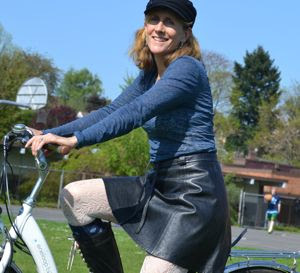 It sounds so corny, but I believe women can really soften and civilize city traffic's rougher edges by biking, and looking good while doing so. Thanking drivers for friendly behavior just can't hurt.